Wiley X is a popular brand of eye wear all on its own and there are many good reasons why. There is a seemingly endless array of high quality eye wear options for anyone in need of glasses whether it is for indoor work, outdoor work, general protective purposes, sports, or recreational activities. Not only is there a long line of eye wear to choose from, anyone who requires prescription lenses can easily find a wide selection of glasses by Wiley X. If you are in the market for durable, protective eye wear that will last you for years to come and include the right corrective lenses for your unique prescription needs, check out six of the most popular prescription Wiley X glasses. Wiley X Saber Advanced Matte Black Glasses With Clear Lenses: These highly praised Wiley X prescription glasses encompass all of the most enviable features that every high quality pair of glasses should have. The sleek, edgy, black frame doesn’t just tout loads of style; it is also constructed of an extremely durable material. And although the frame is sturdy, it is practically weightless as it sits comfortably on your face all day for any kind of tactical work. Speaking of comfort, these glasses prioritize flexibility and come with adjustable saber temples as well as the option to swap it out for a tactical strap. These glasses are also designed with a foam brow bar that absorbs sweat and debris and prevents anything else from getting in your eyes when you are working. The glasses include an RX insert to easily install prescription lenses, but they can also be worn by non-prescription wearers as well. Wiley X Peak Matte Black Glasses: Another ultra edgy, super stylish protective eye wear option, the Wiley X Peak Matte Black Glasses are not only fashionable, they are some of the safest, most durable glasses on the market. These OSHA grade occupational protective glasses are constructed with a rubberized material to minimize any looseness or slipping and ensure a firm grip when wearing them. In addition to its OSHA grade durability, these glasses are also ANSI Z87.1 high impact and optical performance certified. Although they are sturdy, the frames are totally weightless and are ideal for long hours of wearing when working outdoors. These affordable matte black glasses come with a soft cleaning cloth, zipper case, and leash cord. When ordering these prescription glasses, you can choose virtually any color for the lenses whether that is clear, dark brown, orange, light pink, blue or any other shade. For an extra cost, those purchasing these glasses can add a bevy of options including UV protection, anti-fog coating, scratch coating, or anti-reflective coating for even more convenience and security. Wiley X SG-1 Gasket, Matte Black V-Cut Frame With Clear And Smoke Grey Lenses: Not everyone who is in need of protective eye wear wants glasses. Many people find goggles to be a more comfortable solution or something that better fits their preferences. If you would prefer goggles to glasses, this Wiley X option is a favorite among many. These Wiley X glasses are so durable that they are approved for use by both the United States and the Danish military. They are also APEL approved, and NSN and GSA approved. These glasses meet the ANSI Z87.1-2003 High Velocity Standard and the GL-PD 10-12 MCEP Standard, Superseding MIL-PRF-31013 Ballistic Standard. The frames include a top down ventilation system for extra comfort and their lightweight build is NVG compatible. Like many other protective eye wear options, they come with a cleaning cloth, leash cord, and zipper case. Wile X Arrow, Crystal Plum Glasses, #WX-CCARR02F (RX): Don’t let the fun, vibrant plum color frames fool you; though they are a stylish option, these glasses come with multiple safety and security features. These glasses are constructed with a hinge for added durability, a temple strap, and multi-layer foam for even stronger grip and extra comfort. These glasses are most suitable for anyone with small to medium size faces and they come with a Wiley X patented removable facial cavity seal technology. They also come with a Top Down ventilation system to eliminate any fog and they exceed the ANSI Z87.1 high velocity protection standard. Although the frames only come in one color option, those purchasing this eye wear solution can choose from a variety of lens shades including clear, orange, yellow, light pink, several types of grey, and brown. They also can come with transition lenses in shades of brown or grey. If the buyer so chooses, these glasses can include other features for an extra price including anti-fog treatment, UV protection, anti-reflective coating, and scratch coating. Wiley X Crush, Youth Force Sport Glasses #WX-Crush: A list of popular, high quality glasses wouldn’t be complete without including a kid’s option. If you have a young one who is involved in athletics, particularly contact sports, they will probably need protective prescription eye wear while playing instead of traditional eye wear that could easily get damaged during a game. There are several eye wear options to choose from and while all of them are of great quality, the Wiley X Crush, Youth Force Sport Glasses seem to be a favorite among many. They come with an impressive amount of beneficial features including rubber temple bars for a stronger grip and more secure fit and a soft rubber nose bridge. The glasses are also designed with a push button to easily remove the temple and an adjustable elastic button strap that can be attached to the edges of the temples. The glasses are also ideal for youths in sports because the lenses come with a T-Shell anti-scratch coating. In addition to a a scratch-resistant coating, the lenses are shatterproof and offer both UVA and UVB protection to keep visibility optimized on particularly sunny days. Kids can choose from a variety of frame colors including matte grey and blue, matte grey and deep pink, matte grey and neon yellow, and black and red. Lens options include single vision, bifocals, and progressive bifocals. Along with a variety of frame colors to choose from, there are also many lens colors including gray brown, pink, blue, yellow, and orange. Wiley X Romer 3 Matte Black Frame: One of the most affordable options on the market, these glasses offer distortion-free clarity with complete UVA and UVB protection, anti-fog protection, and scratch-resistance. They are sleek and extremely lightweight, making them a comfortable fit for anyone who needs to wear protective glasses for hours at a time. The convenient frame system allows for seamless removal and installation of different lenses. The glasses are also constructed to withstand extreme temperatures and they exceed the standards for high impact protection. Along with its many security features, the glasses come with a soft cleaning cloth to optimize clarity of the lenses, a leash cord, and a zipper case. The lenses can accommodate any prescription including single and double vision as well as progressive bifocals. 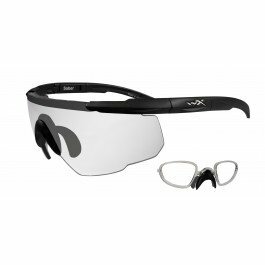 Looking for other excellent, high-end options for prescription Wiley X glasses? Or are you looking for safety eye wear brands? Don’t hesitate to contact us today with any questions or comments you may have. We are eager to share with you the many safety eye wear options that are available.